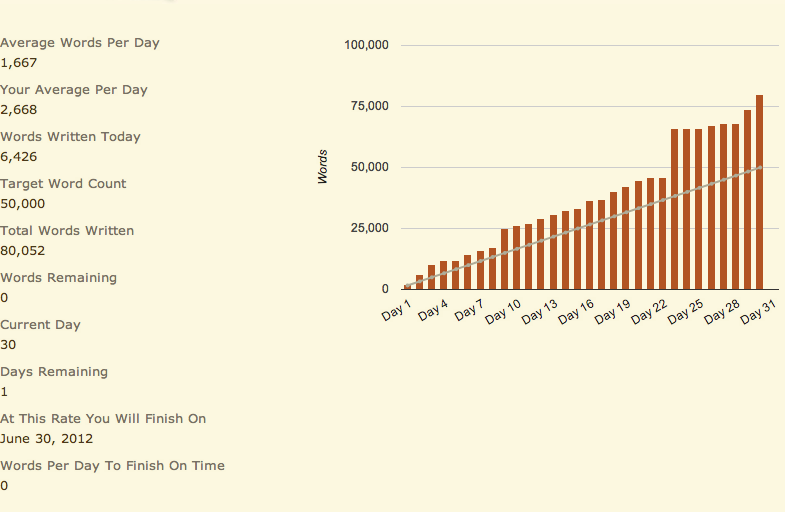 To many who do NaNoWriMo, that’s a major milestone. The last fifteen thousand words? Piece of cake compared to the last thirty five thousand. I honestly wasn’t expecting to hit this today. I had a lot to do today (eye appointment, cleaning the house, etc.) but I ended up with some extra time on my hands and figured I could squeeze in about a thousand words. Then a thousand words became three thousand words. And I’m at perhaps one of my favorite parts of Perverse Selection to write. This gives me an advantage to boost my word count. However tomorrow is Father’s Day and it’s back to work for me on Monday. Plot-wise I’m only about half-way done. One of the big characters in the story undergoes some development. I mean, when their ideal world is crushed right in front of them, it’s time to face the facts. Yes, I can be cruel to my characters. But they’ll never grow if I shelter them. How many words will I hit by the end? I’m thinking sixty thousand. What do you guys think? Over? Under?